With not much communication Thursday, Friday has proven to be quite different. Our team has made strong contact with helicopter pilots from the South African Army. This has enabled our team to get into regions still unreached and to also provide supplies to clinics and posts that have run out or had their stocks damaged. Even so, due to the nature of the situation, coordination is difficult, and resources, including transportation, are in heavy demand. This is very normal in disaster response, so our team is extremely grateful for the partnership they have developed. 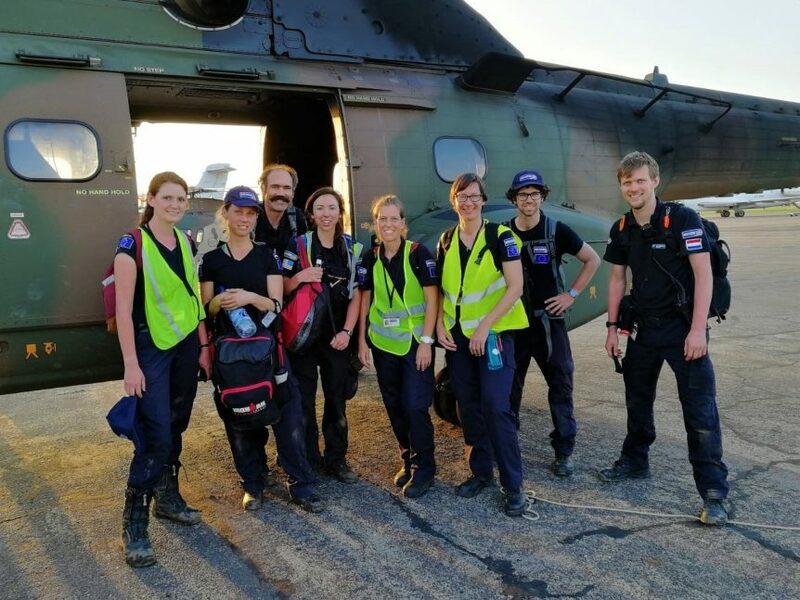 Yesterday (Friday) some members stayed back at base camp, still on the Beira airfield, while others ran missions to the untouched, heavy-hit areas. Those staying at camp were hard at work assisting other teams, coordinating our team’s next steps and supplies and building relationships among other relief teams. On Thursday the team split into two smaller teams who were each able to work in unreached regions. One team worked with a health clinic that had nearly run out of supplies and food. They did what they could with the limited supplies and plan to return Saturday with more supplies in order to be able to meet the tremendous need in that area. The other team was able to assist a health post that was deserted due to a death in the family of the healthcare worker running the post. There were supplies, thankfully, but no workers available. Our team was able to step and provide care for people in that town. Due to timing of transportation they were not able to stay long. Saturday they plan to return for a much longer shift. In addition to hands-on medical care we were able to help with assessments in three more areas. Being able to know where the greatest needs are enables the response to accomplish the greatest good for the greatest number in the shortest time. Food, medical supplies and medical workers are in short supply, so great assessments are crucial. As noted earlier, a Cholera cases are being reported through the affected area in Mozambique. 138 cases have been reported so far, plus over 2,500 other cases of diarrhea. These issues can be life-threatening in an environment where clean water, food and medical supplies are already running extremely low. The World Health organization (WHO) has sent in close to 1 million cholera vaccines. Thank you for joining us with your prayers and finances. We cannot do it without you!